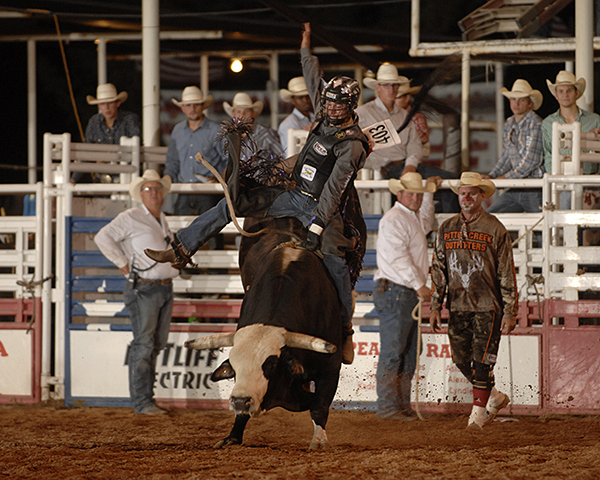 PECOS, Texas – The last thing Beau Schroeder remembers from March 24 was stepping over the bucking chutes to get on his bull at the Fort Mohave (Ariz.) Xtreme Bulls Tour. “Next thing I remember was that I woke up in a hospital with a swollen head and tied down to a bed,” said Schroeder, the reigning Wrangler National Finals Rodeo bull riding average champion from China, Texas. During his ride in Arizona, Schroeder took the right horn to his throat and suffered a torn trachea and collapsed lungs. He needed emergency surgery to have a chance to live. He got a lot more, though. On Wednesday night, he returned to ProRodeo during the first performance of the 130th edition of the West of the Pecos Rodeo. After mounting three practice bulls at his home, Schroeder jumped into the fray that is the summer run of rodeos. He did it in quite the dramatic fashion, riding the Pete Carr’s Classic Pro Rodeo bull Footloose for 89 points to take the early lead in Pecos.